How much do you think repairs will be for this seemingly minor damage? Things to consider: Did the interior get wet? Will the new shingles, siding and paint match? Are any of the materials petroleum based with fluctuating prices? As I have always been told, it doesn’t matter how small your claim is or what caused the damage that led you to file the claim; a claim is a claim is a claim. And it counts against you and it will raise your rates. Even if you withdraw the claim after the fact, or refuse to cash or deposit the claim payment from the insurance company, it still counts as a claim. This is what I was always told by one of my former employers, an insurance company on the list of Fortune 500 companies for every year in recent memory. Now, will it cause you to be dropped from your insurance company and have to look elsewhere for a policy? That depends. As a homeowner and someone who has filed two claims myself, I was dropped by my own insurance company for filing a storm damage claim (wind and hail) and then filing an accidental damage claim (specifically, my girlfriend sat on the edge of our wall-mount sink and tore off half the bathroom wall in our craftsman bungalow). I filed these two claims within two years of each other and they totaled more than $15,000. Apparently, the second claim didn’t sit so well with my carrier’s underwriting department and was the proverbial straw that broke their camel’s back. They determined I was no longer a profitable risk to insure and sent me a non-renewal notice. I was turned loose to find insurance elsewhere, now with two claims on my record. The insurance premium with my new carrier nearly doubled overnight (and believe me, I shopped it around). So, in my own experience, claims not only affect your premium, but your rating as an insurable individual, and that can be a tough lesson to learn. So would I have filed the second claim if I could do it all over again? Of course! 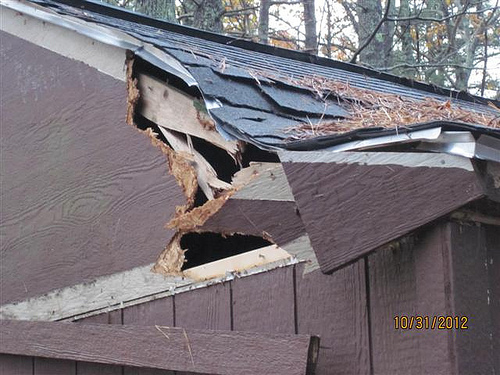 I’m an adjuster and I knew how much the damages would be, and that’s why I filed the claim. But what if I were an average property owner without access to labor and material rates — how would I have known the damages were worth filing a claim for? I would have had to find a contractor to obtain at least one repair estimate, and maybe even two or three. Then I would have had to survive without a bathroom for a couple of days while waiting on the estimate to come back. After that, I would have had to either start repairs immediately (if the price were less than my deductible and agreeable with my pocket book) or call my insurance company to file a claim (if the price were more than my deductible). Then I would have had to wait a couple of more days for my adjuster to come out, and maybe even wait a couple of more days for my adjuster to negotiate with the contractor. By that time, the only bathroom in my house might have been out of service for more than a week, which wouldn’t be so doable. So what could I do to help find out more quickly if the damages are worth filing a claim for? And what could I do to help prevent a small claim or a less-than-deductible claim from needlessly going on my record? I could move proactively and send my repair scope to an estimating service (i.e., Assistimate) that uses the same software most insurance companies use. I could get the estimate back quickly (usually within 24 business hours) and work on getting a contractor estimate in the meantime. With the Assistimate estimate in hand, I could decide whether or not I should file a claim, do so accordingly, then compare the Assistimate estimate to the contractor’s estimate once the latter arrived. Just by using Assistimate, I could possibly save a couple of days’ time, an untold sum of money from potentially excessive contractor estimates, and hundreds of dollars in increased insurance premiums further down the road. When you’re mulling over the question, “Should I file a claim or not?”, just be aware that people underestimate damages as often as they overestimate them. As such, it’s important to make your decision based on real cost information rather than just guessing or casting your fate to a contractor’s bid sheet. With an Assisitmate Detailed Estimate, you’re likely to save money.